Our yoga retreats in Europe take place in five very different locations. For yoga lovers looking for sunshine head to Tuscany in August. If wild nature and exploring is your thing, Iceland and Norway are for you. New in 2018 are retreats in Swedish Lapland and The Azores. Yoga Retreats in Europe – with a touch of luxury. To see our yoga retreat calendar please click here. Lapland Yoga Retreat– On our Lapland yoga retreat we are heading up into the trees for a very special treehouse retreat with Emma Henry. 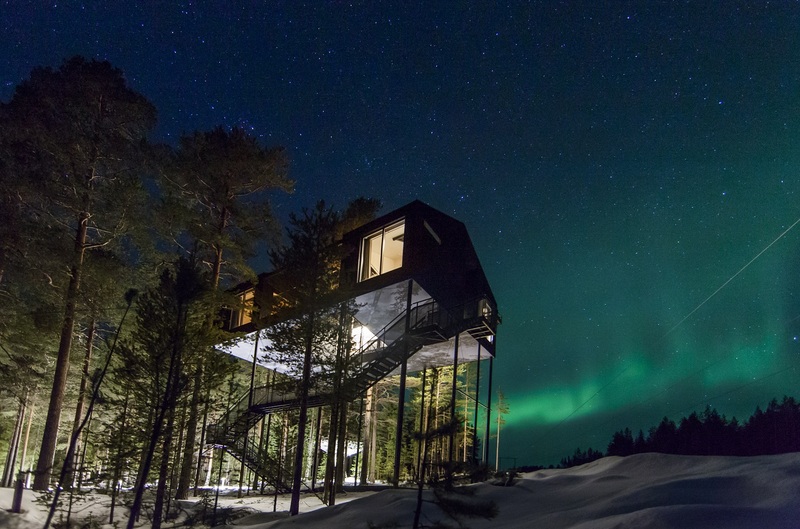 You’ll sleep in sophisticated treehouses designed by Scandinavia’s foremost architects, nestled high up in the trees of a beautiful pine forest in north Sweden. The retreat combines dynamic yoga with options to hike, forage and ride in the forests, try the treehouse sauna, a moose safari and visit Sami reindeer herders. Tuscany Yoga Retreat – Our popular Europe retreat in Tuscany is located on a peaceful private estate close to the medieval walled city of Lucca. We have the run of 5 Tuscan villas, 3 swimming pools, an olive grove and two yoga studios. Set on a terraced hillside with views of the mountains and this is a wonderfully peaceful and picturesque location for your yoga retreat. Leading London teachers Emma Henry and Adam Husler join forces to offer you an epic week of flow yoga classes, workshops and relaxation sessions. Our yoga retreat chefs create a week of high vitality and nourishment with their healthy menus. With space for 40 guests, this one sells out fast. Iceland Yoga Retreat – Technically speaking Iceland is partly in Europe and also in North America! Our Iceland retreat is part of our Arctic wilderness retreat selection – we are based in the north, far from the tourist crowds, on the Troll Peninsula. From our exclusive lodge you can explore the valley, hike to the glacier and nearby waterfalls. We explore the world famous Lake Mývatn geothermal region, where all that makes Iceland so unique can be experienced within a few hours, from powerful waterfalls, characteristic volcanoes, geothermal activity and a nature spa. North Iceland in October is the ideal setting to watch the Northern Lights and our remote location means that if they happen, we’ll have a fantastic show! Norway Yoga Retreat – Our mid-summer yoga retreat with Emma Henry takes place in Senja, an touched part of Norway located in the Arctic Circle. Another stunning Arctic wilderness this remote destination offers a deep experience in wild nature with its dramatic mountains, crystal clear turquoise waters, white beaches and beautiful fjords. With 24 hour daylight there is plenty of time to enjoy the quiet beauty of this secluded paradise and experience the midnight sun, a prolonged sunset and sunrise all at once where everything is bathed in a magical reddish light. The Azores Yoga Retreat– With its dazzling blue lakes, waterfalls, volcanoes and hot springs The Azores islands are one of the Atlantic ocean’s best kept secrets. Our retreat with Adam Husler takes places on an internationally acclaimed architectural family project featuring 10 Japanese cedar wood villas set in 100 acres of beautiful gardens and dense mountainous vegetation. Located in the mystical volcanic Furnas basin and close to a crater lake and hot springs, from here you can enjoy several hiking trails or explore by mountain bike or horseback. We also run yoga retreats in UK and global yoga holidays.